Apartments in apartment house in the centre of village Liptovský Michal. 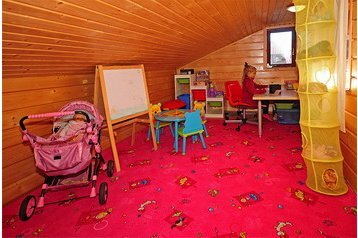 Dayroom in the garden (fireplace, playstation, LCD TV, home cinema, children playground, small kitchenette, shower, toilet), large garden, garden furniture, garden grill, kids play area (small wooden house with slide), climbing wall, swings, sandpit, trampoline, sports ground, party games. Small childrens bed available, children chair, stroller. Internet access Wi-Fi, sauna, for free. Parking in the yard.